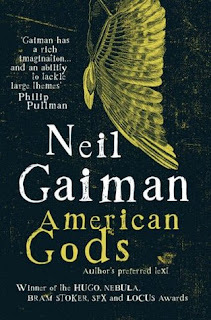 I am almost done with American Gods by Neil Gaiman and I am already recommending it to any person who cares to listen. I won't go on to give a review till I'm done with the book; and in any case most fantasy fans must have already read it. The remnants of the gods of the old world are fading away as people's belief wanes, to be replaced by the new gods of today's world. But they won't give up easy. Beneath the every day troubles of the mortals a real war is taking shape. And Shadow, right after being released from prison, seems to have stumbled his way right into the middle of it. "Odin's Wain, they call it. And the Great Bear. Where we come from, we believe that is a, a thing, a, not a god, but like a god, a bad thing, chained up in those stars. If it escapes, it will eat the whole of everything. And there are three sisters who must watch the sky, all the day, all the night. If he escapes, the thing in the stars, the world is over. Pf!, like that." "My mom used to say, 'Life isn't fair,' " said Shadow. Oh I've really wanted to read this novel. Love the teaser you picked. Teaser tuesday seems an interesting idea isnt it? Great teaser! I have had this on my TBR pile for ages now!! Wonderful teaser. This makes me want to check it out!! Girl, no more book buying! Here is my Teaser Tuesday: THe Lincoln Lawyer by Michael Connelly post! I've been wanting to read this author...thanks for sharing. Oh, I loved this one when I read it. It's so fun! This is not my normal reading genre but I must say your teasers did their job. Looks like a well written book. Thanks for stopping by the Quirky Girls. Great teaser, I haven't read this book but it's on my wishlist. How nice to find a fellow Indian blogger about books - not too many of us around, it seems like. That's true, very few Indian book bloggers, and very few who have the same taste in books as me! Loved your blog, am a follower! Great tease and thanks for stopping by my blog! I loved this book! After pestering him for awhile, my hubby is finally reading it ^_^ This was the first adult novel I read by Gaiman. A friend turned me on to Coraline and I read the Sandman graphic novels. He is an amazing writer! Have you read him before? I suggest The Graveyard Book. Excellent! It's true..we do say that to our kids! Glad to see you are enjoying the book. Thanks for the visit today! @Sinn - I started reading Gaiman after I read Good Omens, about a month ago! Already done with Coraline, The Graveyard Book and now American Gods!! Next I'm reading Anansi Boys :)He really is amazing!! Great teaser. I must add this book to my wishlist! I must admit, I've never read any of Neil Gaiman's stuff--*gasp! * shocking, I know. But this one looks really good. I'm a sucker for deity stories--ESPECIALLY Olympian lore. Loooove it! @Amelia - I know, and the book is also full of such funny bits! :) You should really check it out! Thanks for commenting on my TT! I really enjoyed this book. It was the first Gaiman I read. This was a great quote that will make people want to pick AG up! Neil Gaimaaaaan!! <3 And lovely teasers!